Freedom School 2014 - Essentials of Freedom. What is freedom? From freedom of thought to economic freedom. Freedom School 2014 - Essentials of Freedom. What is freedom? From freedom of thought to economic freedom. Taboos on thinking. Why the taboos? How to take back essential freedoms. And more. 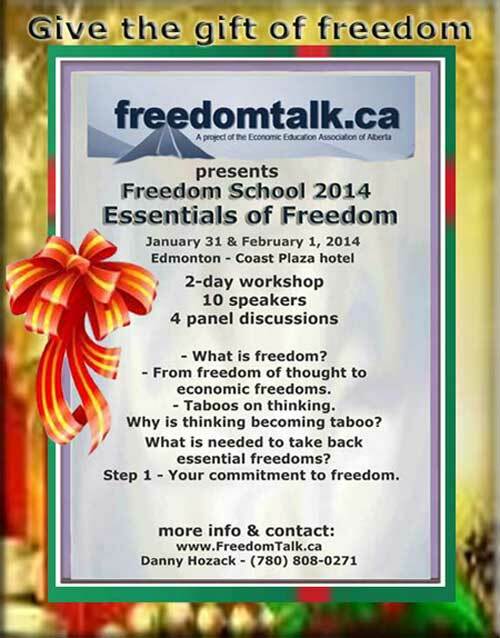 January 31 and February 1 - A Workshop - THE ESSENTIALS OF FREEDOM. In Edmonton. And hopefully online, through streaming video. I'm not the main organizer - those are longtime activists Danny and Pat Hozack. I will be the opening speaker. The topic I'll be speaking on: Freedom of Thought - Essential to Other Freedoms. My key point (which I'm not trying to keep secret): Without freedom of thought, there is no freedom. You're trapped within the blocks in your own mind. In our society we hear so much about emotional barriers - people damaged by childhood trauma, for instance. I hold that, at present, there is at least as much "brain damage" - barriers to thinking inculcated by teachers and parents and peers and the media, very often people who are well-meaning but themselves with massive blocks in their minds. These inner blocks, by the way, are crucial for keeping people from recognizing the dangers of Islam. They're like dikes, in this case keeping good thinking locked behind high walls. But the information is there, ready to flow, just dammed up. I have so much more to say on this topic, but for now, I'll stop here. What are the essentials of freedom? but the inner capacity to think well, to reason. and good thinking, click here. Freedom School 2014 - of Freedom. From freedom of thought to economic freedom. Taboos on thinking. Why the taboos? And more.